Carolle Thibaut-Pomerantz, the New York/Paris-based specialist in vintage and antique wallpapers, returns to the Winter Antiques Show this year in collaboration with another Paris dealership. A Cole Porter armchair by Jean-Michel Frank, c.1928, and a small occasional or gueridon table, c.1925, attributed to Albert-Armand Rateau – two of the items exhibited by Galerie Anne-Sophie Duval which has joined forces with fellow Paris dealership Carolle Thibaut-Pomerantz for a joint display at the Winter Antiques Show. She has joined forces with Galerie Anne-Sophie Duval, which specialises in Art Deco furnishings, and the two will mount a display that mixes Carolle’s distinctive wall decorations, or papiers peints, with a selection of classic Deco pieces designed by such well-known names as Jean-Michel Frank and Eugène Printz. Pictured above are two of Duval’s items: a Cole Porter armchair by Jean-Michel Frank, c.1928, and a small occasional or gueridon table, c.1925, attributed to Albert-Armand Rateau. They are set against a backdrop of one of four scenes from Thibaud-Pomerantz’s set of Jardins Anglais wallpaper by Joseph Dufour, c.1803. This design, by the painter Pierre-Antoine Mongin, is considered to be the precursor of the panoramic scene. It is the only known complete set and has never been hung. 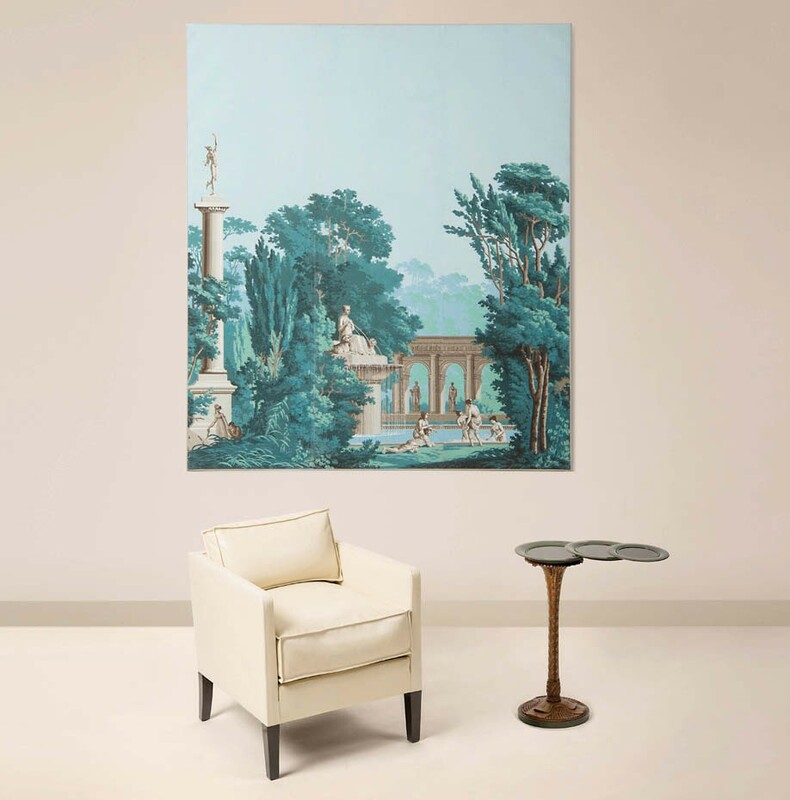 Prices for the Thibaut-Pomerantz wallpapers range from around $1500 for some of her smaller Art Deco panels up to $90,000 for the Jardins Anglais.